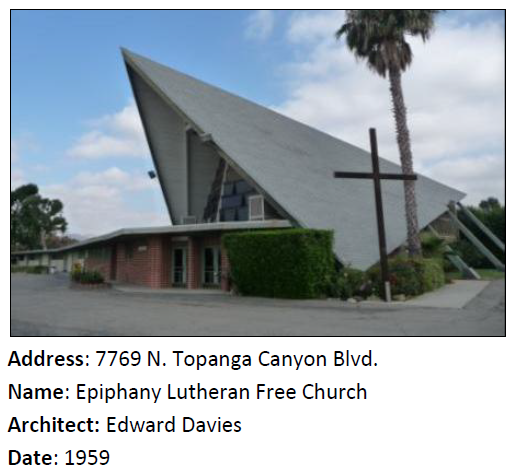 A Mid-Century Modern church in Canoga Park. You might not think a poultry farming colony, space rockets, water politics and ranch houses have anything in common, but the southwest corner of the San Fernando Valley is proof that they do. 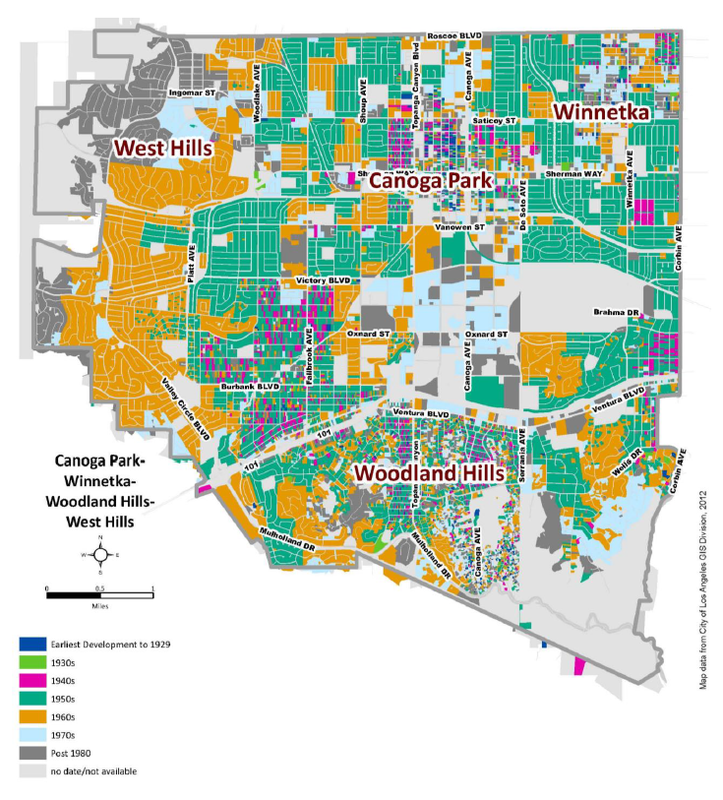 SurveyLA has released a report of its findings for the Canoga Park – Winnetka – Woodland Hills – West Hills Community Plan Area. Before I type out any more place names, how about a map to get oriented? This map is color-coded to show the decade when parcels were developed (mostly in the 1950s and 60s). In the mid-19th century, this area was part of the Leonis Ranch. Miguel Leonis’ adobe is still around and is Los Angeles’ very first Historic-Cultural Monument, designated way back in 1962 when development in the area was booming. Since the Leonis Adobe already has a historic designation, SurveyLA didn’t re-survey it. As is the case with several other places in Los Angeles, the community names we recognize today weren’t always in use. Canoga Park grew out of a community called Owensmouth that sprang up in the 1910s. Winnetka got its start as the Weeks Poultry Colony, a short lived (1923-34) community of one-acre lots designed for residence and agriculture. Before Woodland Hills was Woodland Hills, it was the town of Girard, a development of “mountain cabins” a country club and prolific tree plantings that are still around today. By the time 1900 rolled around the survey area was sparsely populated and dry (except when floods made it too wet). Although it hardly seemed promising as a residential community in those days, things began to change when the Harry Chandler and his syndicate bought most of the San Fernando Valley in 1909. Their Los Angeles Suburban Homes Company wasn’t shy about getting infrastructure to their new land. The Pacific Electric streetcar system reached Owensmouth by 1912 and the LA Aqueduct started bringing in water from the Owens Valley in 1913. By the 1930s the Army Corps of Engineers had begun taming the river and its floods with concrete, but the Depression and World War II prevented the area from being widely urbanized until after 1945. Although city planners made some attempts to conserve sections of the San Fernando Valley’s agricultural land in the 1940s, a variety of factors undermined those plans. Housing demand, pent up during the Depression and exploding with the postwar baby boom, was through the roof and as land values rose, the property taxes became too high for most agriculture to survive. The completion of the 405 and 101 freeways in the 1960s further facilitated suburban commuting. These weren’t just bedroom communities however. Significant job growth occurred as well, with notable employment centers in the aerospace and defense industries. Late to the urbanization game was Harry Warner’s ranch. When the movie mogul finally gave up his land to less pastoral pursuits in the 1970s, the development of Warner Center began. Its tall office buildings stand in stark contrast to the development patterns of most of the survey area. Warner Center’s development history runs into the 1980s (and beyond) and as a result was not studied in its entirety by SurveyLA. I’ve added pictures of some of my favorite finds below. Clicking on a photo will enlarge it and start slideshow mode. Check out how architectural historians distinguish between sub-types of Ranch houses (I’ve included three examples below). Although Ranch houses are ubiquitous in many places, not all examples of this quintessentially suburban style have escaped alteration or rise to an extraordinary level of artistic merit. 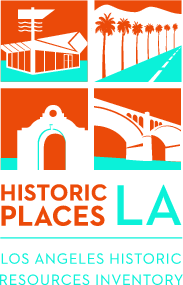 Your historic place suggestions help fuel SurveyLA. Please keep them coming! This Craftsman house built as part of the town of Owensmouth is one of the oldest intact buildings in the survey area. In its heyday the Weeks Poultry Colony was full of one-acre lots like this one where people lived by raising chickens. Most of these lots have been subdivided. This Tudor Revival house is an example of the “mountain cabins” in the former town of Girard. The Los Angeles River, so pivotal to the history of the City, begins its 51 mile trek to the sea here at the confluence of the Calabasas and Bell Creeks. Channelization helped the area to grow by reducing the risk of flood. The survey work on Corbin Palms was aided by an entry on MyHistoricLA.org! It was picked up as a planning district because too many buildings were altered for it to hold together as a historic district. A Traditional Ranch house in Woodland Hills. This entry was posted in Uncategorized and tagged Canoga Park, SurveyLA Reports, West Hills, Winnetka, Woodland Hills. Bookmark the permalink.